Noksapyeong Subway Station transformed into an art gallery with a garden where public artworks, natural light, and plants merge together. The wicket that was on the second basement floor was moved to the fourth floor basement to open the entire subway station space to the public, from basement levels 1-4, excluding the platform. The unique and beautiful architecture of Noksapyeong Station was constructively utilized for artworks display and an underground garden, from the station entrance to the fifth floor basement with the platform. Along the entire inner wall of Noksapyeong Station’s large, 35-meter trademark courtyard, or main hall, will hang a thin metal curtain to reflect the sunlight shining in through the glass ceiling dome of the central courtyard, while the inside of the station will be made into a giant canvas that encompasses lights in a constantly changing motion. The lights will change while riding the escalator to create a sense of space transformation. In the fourth floor basement waiting room, previously neglected despite being an open area, artworks based on forest theme are awaiting visitors. From the ceiling hangs knitted, aluminum wires that create an atmosphere similar to a tunnel filled with vegetation with one side containing installation artworks resembling the pine tree trails of Namsan Mountain. The innermost space, the fifth floor basement platform, is filled with works showcasing the docile, warm coloring of colored pencils that brighten the unwelcoming atmosphere of the platform. The empty circular hall on the fourth floor basement transformed into a plant garden with over 600 different plants. In addition to being a space of seeing and healing, gardeners will cultivate plants, amid a series of gardening programs, in which the public may freely participate. The Noksapyeong Station Underground Art Garden is composed of public artworks by seven global artists and local intermediate and rising artists, an underground plant garden, and public facilities, including a gallery and seminar room. The Underground Plant Garden was created underground at a depth reaching the height of an 11 story building, located at the fourth floor basement’s circular hall. The natural light that penetrates through the glass ceiling dome during the daytime enhances the panoramic of the area. The neglected spaces were used to create the first floor basement gallery and fourth floor basement seminar room for public use. The spaces are planned for use involving exhibitions, art programs, lectures, and performances. 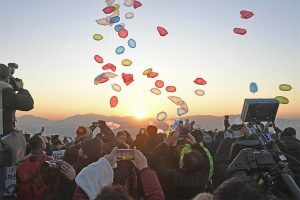 With the opening of Noksapyeong Station’s public art garden, the Noksapyeong Walk program is scheduled to launch on a regular basis, which is a program entailing a walking tour from Noksapyeong Station through Yongsan Park Gallery and around Yongsan Garrison. 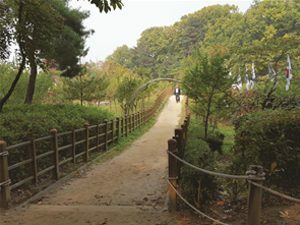 The Noksapyeong Walk is a public-participatory program and walking tour linked with the Yongsan Park Gallery that beings from the first floor basement of Noksapyeong Station. Advanced program registration is open to the public via the Public Service Reservation website (yeyak.seoul.go.kr). The ‘Noksapyeong Public Art Project’ does not simply import artworks into the subway station, but rather, is a new attempt to innovatively change the way subway station spaces are used. Artwork and public spaces along the inner structure of Noksapyeong Station naturally integrated into the current space, like wallpaper, to enable a transformation into an art gallery for its entirety to become a piece of art in itself.